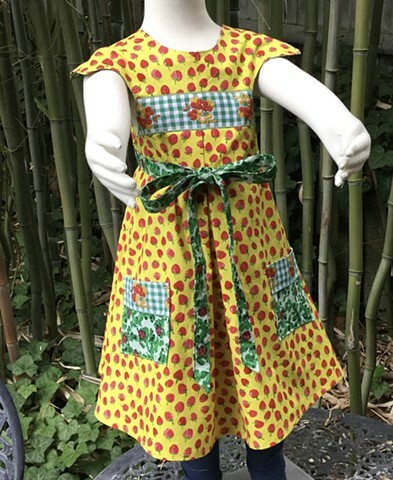 Cheery beyond belief, “Strawberries and Ladybugs” is a bright yellow sundress, wrap-around style, for a Pre-School (age 3-4) girl who loves to dance! Ample skirt for maximum twirling, unique cap sleeves, enhanced with imported embroidered trim on bodice and pockets measures 22” across chest, 22” long shoulder to hem. Ties wrap around waist from over-lapping back, $90, 100% cotton new fabric, totally washable, made by the designer herself and shipped free to any address in the U.S. #238.